Yes, in this incarnation of the classic game, there's only one thing that should be on your mind during gameplay: Highest Lance Wins. Sounds simple, but there's depth present here that could be easily overlooked. 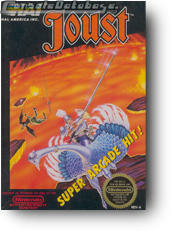 Like many games of its caliber (though there are few), Joust has an epic history behind it. Some may think of it as a classic two-player arcade game from the local bowling alley. Some may recall playing it on Atari when it was first released for home use. Others still may have played one of the endless variations that float around the internet under a different name. Joust on the NES looks and plays similar to all of these. As a common bird-knight in quasi-medieval/prehistoric times, your main objective here is to out-joust all enemy jousters during the game. Inexplicably, your human opponents hatch from bird eggs: disturbing, yes, but the dark ages/mesozoic era were hard times. Basic strategy consists of flapping your bird into flight (by repeatedly pressing the A button, or holding the B button) and attempting to get your lance above that of your numerous airborne opponents. If you succeed, your opponent will be reduced to egg form. This sneaky form will hatch into a tougher opponent if left alone for more than 20 seconds, which means a great jouster must possess quick wits and even quicker reflexes to overcome it. To prevent the eggs from hatching, you must face your deepest fears, plunging your trusty bird-steed towards the ground (and almost certain death) while attempting to crush the crafty eggs by using its talons (read: running into the egg). As if this weren't enough to make most people's stomachs turn, the danger is only beginning. Along with the three levels of "normal" enemies, including the vile Shadow Lords, with their ability to wield a lance only equaled by Odin himself, there is an enemy as sinister as any villian ever created. This enemy is the (Unbeatable?) Pteropactyl. Anyone that hears its cry can only hope for a quick and painless death. 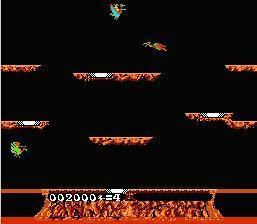 The Pteropactyl appears when a player takes too long to finish a stage, and can be seen (though rarely) in multiple numbers. If you have a death wish, try to defeat it. But don't assume for a second that you will emerge victorious. Taking on a menacing Pteropactyl with nothing but a lance is a suicide mission, but someone out there is always naive enough to try it anyway. There are four levels of gameplay in Joust for the NES: 1-player game A, 1-player game B, 2-player game A, and 2-player game B. I will warn you that game B is not for the faint of heart. The enemies are faster and more numerous as well as more intelligent, and the Pteropactyl...well, let's just say things will get very ugly very quickly. All game modes feature well over 6,438 levels, offering gameplay that's limited only by your endurance. The 2-player game modes are basically meant to end friendships. Pick up a controller with your friend and "cooperate" to defeat the enemy. But as soon as you accidently joust (and brutally kill) your friend, the revenge jousts commence. "Oh, I'm sorry, I was trying to get the guy right above you." "Yeah, I was trying to crush that egg!" --All ridiculous excuses for one selfish reason: more points equals more lives. Vengeful gameplay will result in short games and shorter tempers, so make sure you're playing with a true friend. When everything's said and done, Joust is a great game to just pick up and play for a few rounds. Controller-throwing is a common occurance, and appalling lance heights by the Shadow Lords can cause televisions to be screamed at. In the end, though, you'll always feel good about a great round of jousting, and there's the kind of satisfaction when (if) you defeat a Pteropactyl that few things in life can rival. Be strong, and may your lance always be the highest.